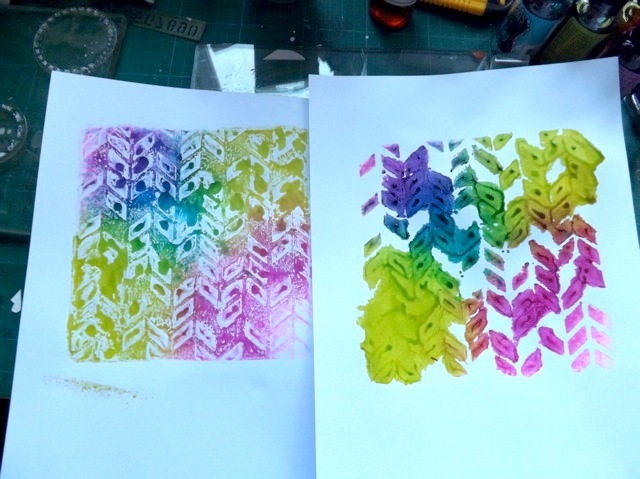 OK, so I’ve been watching Julie Fei-Fan Balzer and her free stencil classes on Spreecast. I’ve done a few of her online classes and always enjoy them. 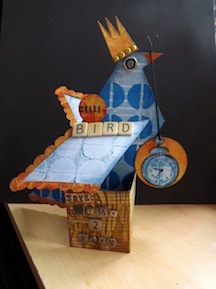 She has been doing a Q&A at the end and one thing that comes up often is using spray inks on the Gelli plate. 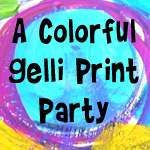 When I first got mine, I remember reading, probably on the Gelli Arts site, that ink will stain the plate. When I only had the 6×6 plate I worried I might ruin it, so I was more cautious that is my way. Now I have the 8×10 as well, I feel a little less worried I might do something and ruin my plate! 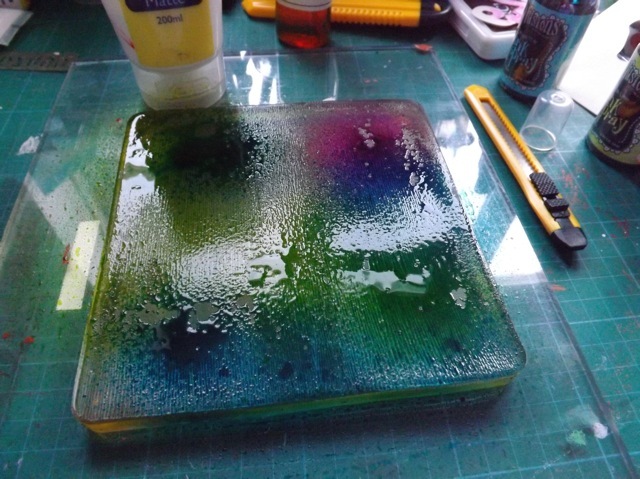 Plus, discovering the baby oil when massaged into the plate will lift out any deeply embedded colour, I know I can clean it up with ease. And that made me want to have a go. 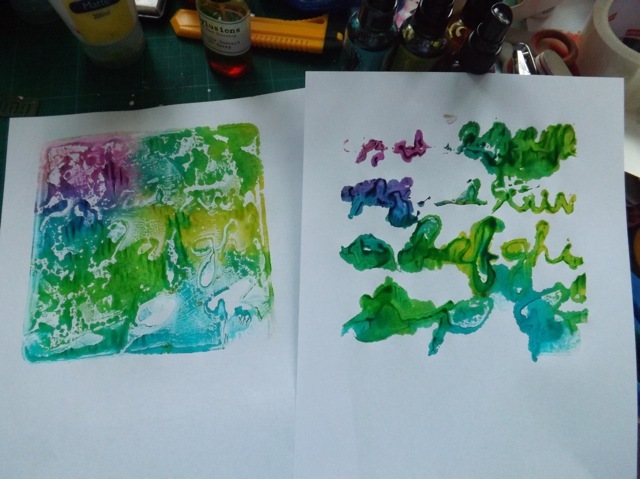 Thinking things thru, as I do, I thought about using maybe paint as a base, then spraying the ink over that, but the colour of the paint would always affect the colour and at least for the first experiments I wanted to keep it pretty pure. 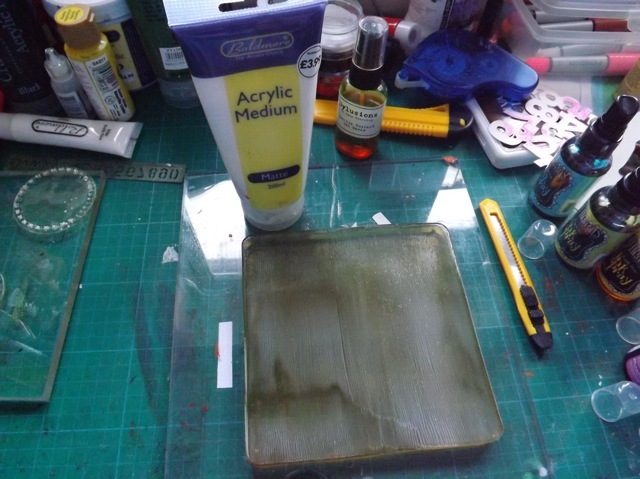 So I went to my much-loved Acrylic medium. Rolled that out onto the plate first, to give the ink something to cling to rather than beading up instantly. I was aiming for a very light spray – in fact I think I ended up with a bit more than I wanted. While I love the look of both of these, the right one, pulled thru the stencil, is pretty indistinct. The left one , pulled after the stencil was removed, is really smeary but still cool. That stencil has small open areas and a lot of stencil. This one has more open areas, plus it’s covered with layers of paint so the stencil doesn’t slide around as much. 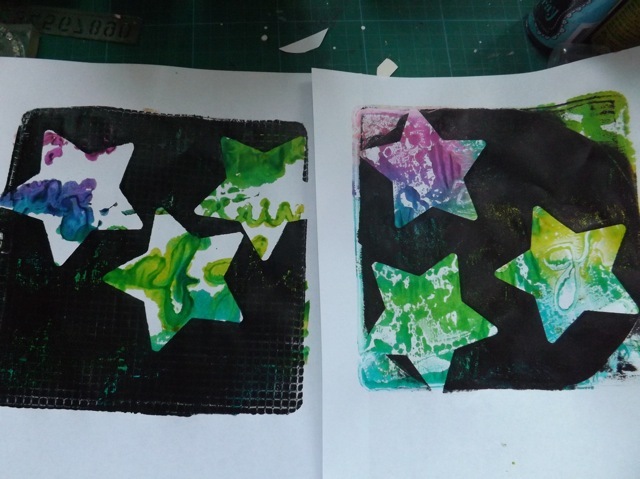 I like both of these, but the print after removing the stencil ( left) is really cool. 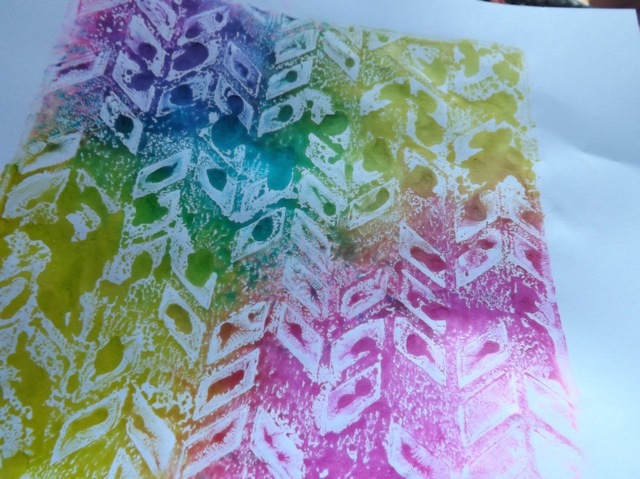 One thing I did try was then pulling a paint print over an ink print, masking off interesting areas so they show thru. Def. something fun to play with a lot more! Clearly I’ve not perfected this quite yet, but you know me – I always share my experiments as I go. Now I want to think on it a little more and see where I want to take it…. 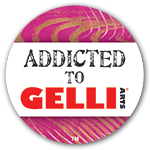 Categories: Gelli plate monoprints, inks | Tags: Gelli plate, inks | Permalink.